My most recent Custom Pinball Machine utilized a multi-level playfield, which requires the steeper slope you typically see on more modern cabinets. I’ve posted templates for this design for those that are either looking for a modern feel, or need the extra headroom for flying wire-forms or alpha-ramps (or just an old-school upper level playfield). I call this latest pin “Miss Adventure”, so all the files will have the initial MA right after the date code. These can all be found on the download page. 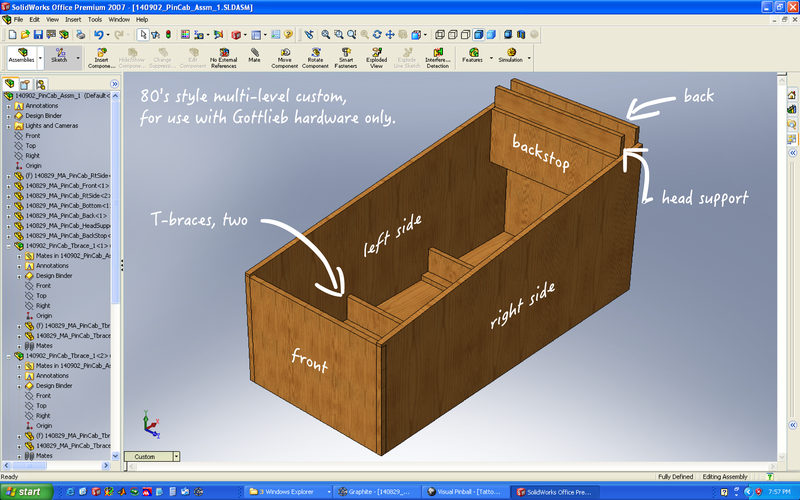 Please understand ahead of time that the Cabinet depth is designed to work with Gottlieb lockdown bar hardware, and a Custom Head (template for this to follow in the next post). Note that, as in the previous post, the front corners are intended to be mitered for a high-quality professional look. 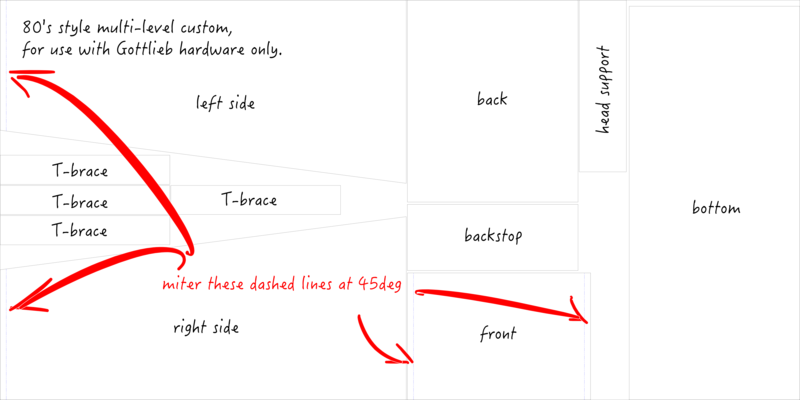 If you’re not going to do this step for whatever reason, be sure to take off an extra 3/4″ cut (indicated by the blue dash in the SVG and DXF files), but only take this off either 1) front of both left and right side pieces (preferred) or 2) both edges of the front piece (less-preferred). This template is designed to be mostly cut from a single sheet of 4’x8′ plywood, 3/4″ thick. Birch top is usually relatively cheap while providing a quality finish. Some other minor pieces are needed, which I usually cut from pine stock. I’ll detail this in the next post related to the Head fabrication. Template for cutting Custom Cabinet pieces from a single sheet of 4’x8′ Birch plywood. Hi, thanks for planning to talk about mounting the playfield walls that I asked about, I will wait until you say how you do it. However, I realized that I have no idea where to cut the plunger and flipper button holes into the cabinet. I’m assuming that the flipper button holes don’t particularly matter so long as they are in a comfortable position, but the exact placement for the plunger is really important, and can be guessed. Do you have measurements for where these holes go? I’ve got shop permissions for the 24th, so if you can respond by then that would be fantastic. It’s OK if you can’t though, ill just have to hunt down a pinball machine near me and just make rough measurements from that. Also, I’m sorry if i am wasting your time when I ask all of these questions, it must annoy you quite a bit. I’ll try to ask less in the future. I really like your blog, and I’ve been using it to help me do lots of stuff for my machine. Thank You! P.S, I will be trying to use adhesive spray mount to stick some massive paper prints onto the cabinet, then coating the outside layer of the image with polyurethane, to give it a nice finish. If this works, I’ll post a comment with pictures of the results so you could use that method of cabinet artwork if you wish.